What kind of wedding would two self-proclaimed geeks who met while working at a KB Toys store have? If Ian and Maureen's comics-tastic wedding invitation is any indication, most likely an awesome one. Neatorama's post alerted me to the existence of this almost fatally cute and ingenious invite. 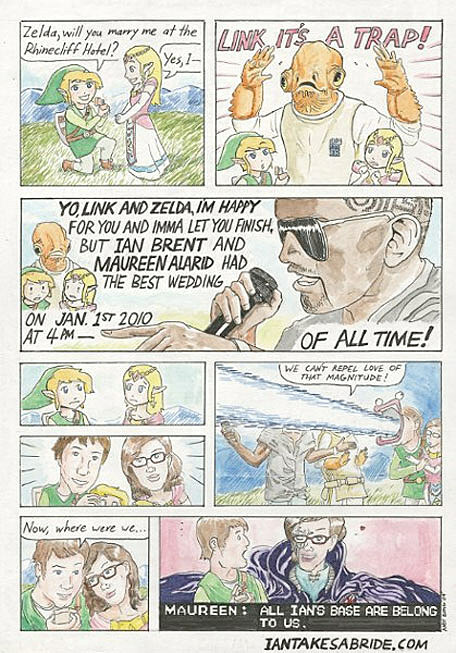 "And special thanks to Mr. Andy Bong who is the only person we know who can take the vague request 'Can you make us a comic with Kanye West, Star Wars and maybe some laser blasting... oh and its a wedding invite so can it be adorable and sweet too?' and turn it into something that has been blogged (offbeatbride.com rocks! ), Tweeted about, and is currently alleged to be circulating in a chain email (Really? Someone send it to us!). We wanted it to be funny and show how much in love we are(and what dorks we are too, oops!) Well done, sir!" Read it close up here, or after the jump. Did your wedding use comics? Do you have pics? Hit us up.